Invitation letter from Launceston Tramway Museum Society Mr. Hiroyuki Tajiri a member of KRC sent bogie trucks and components for restoration of Launceston tramcar No.29 on October 2001. After the one year effort, the Museum member finished the restoration of No.29. 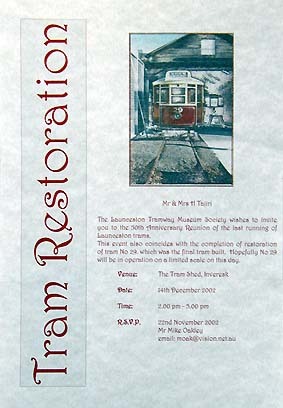 They have ceremony 50th anniversary reunion of the last running of launceston trams and restoration of No.29 on December 14, 2002 at their site. Mr. Tajiri was invited this ceremony honoroubly.